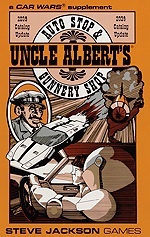 Daily Illuminator: Uncle Albert Wants Your Money! February 3, 2014: Uncle Albert Wants Your Money! Uncle Albert: a name that for years cunning car warriors and aspiring autoduellists have entrusted with their lives. He's back, with a newly released classic digital reprint of a future-retro catalog. (Is that enough temporal confusion for you?) Uncle Albert's 2039 Catalog Update has over 90 additional Car Wars items for your offensive, defensive, or personal needs. Fire a torpedo, drop a beacon mine, or get out of the way with your own jump jet. These and more are within the pages of this catalog. Listen to your pal Uncle Al and download it today; after all, who's it going to hurt?